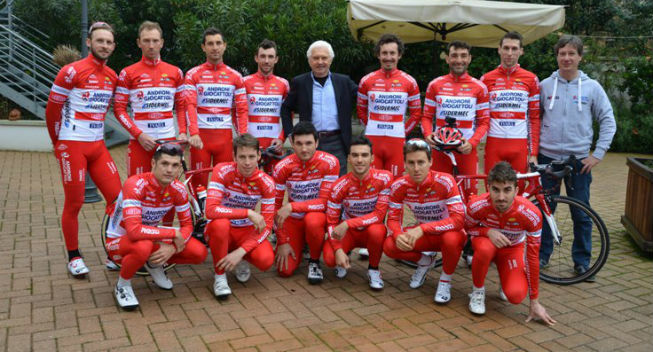 Androni Giocattoli - Sidermec is starting to prepare for the new season. The Professional Italian team is gathered for in Galzignano Terme where the riders are laying the foundations for 2017. Present at the camp are also Matteo Malucelli, Andrea Palini and Matteo Spreafico who have been announced as new signings. The trio is joined by the other new signings Davide Ballerini, Fausto Masada, Andrea Vendrame , Raffaello Bonussi who raced with the team as a stagiaire in the second half of the season, and Mattia Cattaneo who arrives from Lampre-Merida. Francesco Gavazzi , Marco Frapporti, Luca Pacioni, Alessio Taliani and Andrea Benfatto who will continue with the team are also present. Only the Colombians Egan Bernalm Rodolfo Torres and Ivan Sosa are absent. The biggest name among the new signings is Andrea Palini who is a former Lampre-Merida rider and has had huge success with the Skydive Dubai team during the last few years.